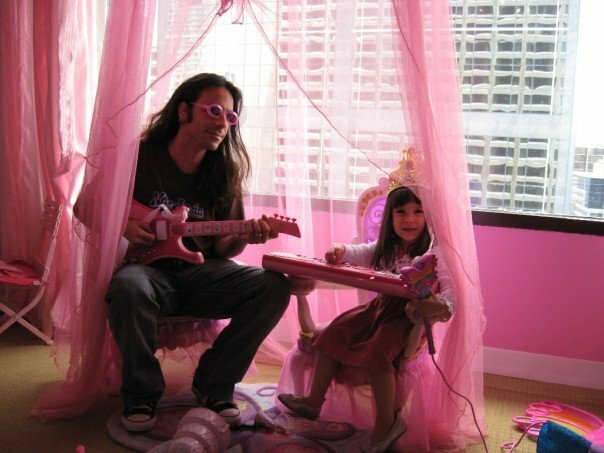 In working in the music industry for over 20 years, I can’t tell you how many artists I’ve met who were consumed by music as children, or during their teenage years. They could have only dream of playing music in a band. It helps if you have access to an instrument, but sometimes it’s an emotional fact that some schools and community groups don’t have money to buy them. 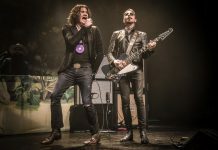 In Canada, we’re all lucky to have MusiCounts, the music education charity associated with The Canadian Academy of Recording Arts and Sciences (CARAS) and the Canadian Country Music Association (CCMA) is helping to keep music alive across Canada. MusiCounts’ mission is to ensure that children in Canada, regardless of socio-economic circumstances or cultural background, have access to music programs through their schools and communities. This is achieved through the Band Aid Program, the TD Community Music Program, the MusiCounts Teacher of the Year Award, Scholarships and other music education initiatives. Since MusiCounts’ establishment in 1997, nearly $8,000,000 will have been awarded to help support music education in Canada. These funds have benefited over 700 schools and communities from coast to coast, supported over 330 post-secondary music program graduates and honoured 10 extraordinary music teachers through the MusiCounts Teacher of the Year Award. 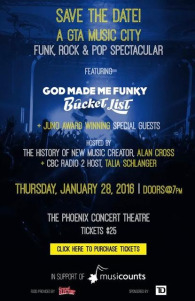 On January 28, Canada’s music and education charity MusiCounts will provide Toronto with a funk, rock and pop spectacular at The Phoenix Concert Theatre. Sponsored by TD, the benefit concert will feature performances by God Made Me Funky, Bucket List, Joey Landreth of The Bros. Landreth, Simone Denny, Lee Aaron and indie pop outfit The Elwins. 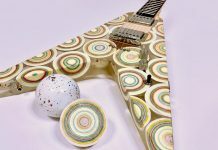 All proceeds raised will help fund various MusiCounts programs such as MusiCounts Band Aid Grants, a musical instrument grant program, and the MusiCounts Teacher of the Year Award which recognizes music teachers with outstanding dedication to inspiring and nurturing the musical growth of Canadian youth. Tickets are available for purchase at Ticket Break. Buy a ticket. Go to the event. Buy a few tickets for friends and family, or get in touch with MusiCounts to show you believe in the power of music.